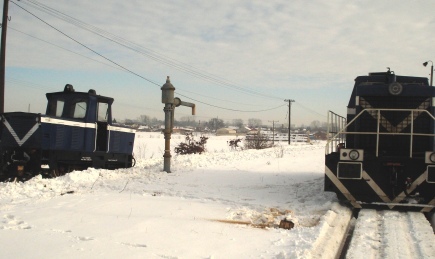 Romanian railcar MBxd2-216 back in action on the Pleszew Railway. Photo SKPL. 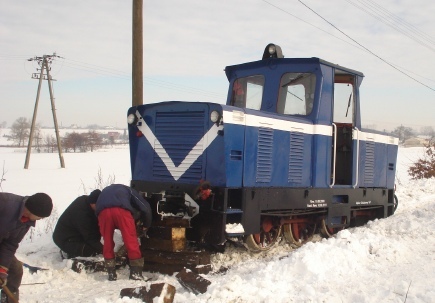 After a long break, while the engine on Romanian diesel railcar MBxd2-216 was replaced, passenger services were restored on the Pleszew Railway in February. Three pairs of trains between Pleszew Miasto and Pleszew Waski are run in the morning and another three are run in the afternoons. Trains are held at Pleszew Waski until their connections from Ostrow Wielkopolski or Poznan Glowny arrive. New hope for Naleczow Railway? Lxd3-348 in the Naleczow Railway’s Karczmiska workshops. Will the locomotive and the Naleczow Railway ever emerge from the shadows? Photo ©Michal Stateczny. The chief executive of Opole District has gone on record saying that he is hopeful that the Naleczow Railway will be able to resume operations this summer and that he is holding talks with two interested parties regarding the possibility of one of them taking over the responsibility for operating the railway. The line was formerly operated by SKPL, but the Association withdrew in January 2009 when the District Council failed to agree a subsidy to keep the line running. No trains ran in 2009. The District Council finally obtained the freehold of the line from PKP later that year and is thinking of either setting up its own operating company, or negotiating an arrangement with an existing narrow gauge operator. The District Council has been awarded an EU grant totally several hundred thousand zloty towards the costs of a project entitled ‘The Narrow Gauge Railway on the bank of the Vistula as the hallmark of tourism development in the Lubelsczyzna Region’. Encouraging though this news is, it seems that those monies that will actually be spent on the railway (as opposed to the promotion of tourism) will only be used to finance the rebuilding of the station buildings at Karczmiska and not the badly needed restoration of the track and rolling stock. Meanwhile, the Opole District Council, the Vistula Riverbank Museum and the Karczmiska Municipality have made an application for a second EU-funded project. This time the funds would be spent not only on the restoration of the other station buildings, but also the repair of track and rolling stock and the purchase of bicycles for hire! Let’s hope that the second application is also successful! Nowy Targ – Sucha Horá: Revival or cyclepath? Railways in the Podhale. Map from Railmap – kolejowa mapa Polski. The fate which has befallen the railway line which used to connect Kralovany in the Slovak Republic to Nowy Targ in Poland shows what ‘might have been’ if Balcerowicz’s economic reforms had not slashed investment in Poland’s railways. On the Slovak side (no IMF adjustment program) the railway continues to operate as far as Trstená, a town of some 7,000 residents, 10 km short of the Polish border near Sucha Horá. On the Polish side most of the 20 km of track between Sucha Horá and Nowy Targ has been lifted and the local authorities are now planning to build a cycle path on the railway formation. Yet it need not have been so as this brief dip into the line’s history will show. In 1899, the construction of a railway line along the Orava valley from Kralovany to Sucha Horá was completed. In the same year the railway from Chabowka to Zakopany was opened. It only remained to construct the missing link. Two rival routes were promoted: one, from Sucha Horá via Czarny Dunajec to Nowy Targ, was backed by the government; the other, via Koscielisko and Witow to Chocholow, was championed by Count Zamojski. After three years of bitter argument the Nowy Targ route was chosen and the line opened for traffic in 1904. A new steam shed was established at Nowy Targ to provide motive power for the line. The line survived WWI relatively unscathed, but a bridge was blown up at the beginning of WWII and plans to restore the border crossing near Sucha Horá were blocked. Although the line was now truncated short of the border, traffic on the Polish section of the line was to reach its zenith in the 1950s. In 1949, the Communist authorities decided to construct a model socialist town and steel works at Nowa Huta next to Krakow. The construction activities demanded a never-ending supply of gravel and four gravel pits were constructed close to the line. Those at Podczerwone, Rogoznik and Czarny Dunajec had their own 600 mm narrow gauge railways, and all were operated by small steam locomotives. The largest system, at Czarny Dunajec, used 5 steam locomotives as well as a number of diesel locomotives. In the 1950s, the number of passenger services was increased to bring workers to a giant shoe factory that was established on the Western outskirts of Nowy Targ. The station at Ludzmierz was closed and a new station, Nowy Targ Fabryczny, was opened to serve the shoe factory. By the 1970s, the permanent way was in a decidedly bad way, and bus services captured most of the passenger traffic. Then, unexpectedly in 1982, the track was relaid between Nowy Targ and Czarny Dunajec. There was talk of reopening the border crossing and using the line to export materials from Poland. But the work on the track was halted as suddenly as it had been begun and the unrestored section between Czarny Dunajec and Podczerwone was used for a time to store redundant goods wagons. The line was served by one or two daily freight trains until 1989 when the 6km of track beyond Czarny Dunajec was lifted. Passenger services had ceased on year earlier. In 1989 the last ‘sheep train’ bringing sheep off the mountains to their winter pastures also ran. The line was steam hauled until the end – in the autumn of 1989 a locomotive based at Chabowka was sent to Czarny Dunajec to retrieve some freight wagons. After the line’s closure, the Czarny Dunajec municipal council made overtures to PKP to reopen the line, but PKP refused to do this without a major cash injection. In September 1991, Piotr Kumelowski, a New York railway enthusiast with Polish roots launched a last minute appeal to save the line, but alas to no avail. By December 1991, when the track only reached the 9.4 km post, track lifting recommenced. But the line still lives on in the imaginations of local residents. At a meting of the Rada Naukowa Związku Podhalan – a think tank drawn from people who have roots in the area – a proposal by Senator Tadeusz Skorupy to relay the line and reconnect it it to the railway at Trstená was enthusiastically endorsed. Trstená is very close to the Orava lake, a major tourist attraction just over the Polish border. Senator Skorup’s proposal was supported by a study carried out by a team from Krakow Polytechnic. Sadly, some of the local authorities who had once fought so hard to save the line have now ‘moved on’ and are now working together to build a cycle path on the railway formation. The WordPress.com blog announcement about the outage. Apologies to readers who tried to access either Behind The Water Tower or Tunnel Vision last night. Our hosts WordPress.com had a 2 hour outage last yesterday evening. During our two years on WordPress, this has been the first major problem that we have encountered. WordPress has proven to be sophisticated, yet easy-to-use, blogging environment and we have no regrets about our choice. We would thoroughly recommend WordPress to anyone looking for a versatile blog engine and a reliable blog host. Krosniewice, the beginning of a new beginning? A busy day at Krosniewice in PKP days, October 1996. Romanian Railcar (left) for Ostrowy and DIY Polish railcar (middle) for Cetty. There was much celebration at BTWT headquarters yesterday and our emergency ration of Zubrowka was raided when the news was confirmed by two reliable sources that the Lodz provincial government is taking over the Krosniewice Railway from PKP. This remarkable turn of events will scupper the plans of Krosniewice Mayor, Barbara Herman, who wanted to divide the railway salami fashion among all the local authorities through which the railway ran. So far, the Lodz provincial government hsa shown remarkably little interest in its railway heritage and the railway enthusiaststo whom I broke the news could not at first believe it!. There are several unsung heroes in the battles for the future of the Krosniewice Railway and it is appropriate to mention some of those to whom credit is due. First of all, Wojciech Szegendowski, the Conservator of Heritage for Lodz province, who stood up to pressure from Mrs Herman to remove heritage listing status from much of the track and buildings at Krosniewice. Secondly, Pawel Papierz and the members of the SKOKW railway society who lobbied hard for the future of the railway. Thirdly, David Morgan, the President of Fedecrail who met with Polish ministers in 2008 to emphasise the importance of the Krosniewice Railway to the international heritage railway community, and last all those BTWT readers who supported our letter writing campaign to the Mrs Herman with copies to the Ministries of Infrastructure and Culture! I am a British national who regularly comes to Poland to learn about your country’s history and to travel on your unique heritage railways. I would like to congratulate you on your decision to end the uncertainty regarding the future of the Krosniewice Railway by taking over the track from PKP. The Kujawy Railways – of which the Krosniewice Railway is a part – are an absolutely unique part of Poland’s railway history and have an enormous future potential as a tourist attraction. I hope very much that it will be possible for the Krosniewice Railway to become a working railway – there are many preserved tourists lines in Europe – what makes Poland special, and draws railway enthusiasts from all over the world, is the opportunity to see vintage railway machinery performing real work. We have already featured Tomasz Domzalski’s amazing photography in our post ‘The fire goes out in the last Tr5 in the world’. Well it seemed that we spoke too soon, for Tr5-65 received another extension to its boiler certificate. The Towarzystwo Przyjaciol Wolsztynskiej Parowozowni (Friends of Wolsztyn Shed), which had organised a very successful ‘Farewell to Tr5’ special in December, rapidly organised another special for 6 February. Unfortunately, it appears that we were right to be pessimistic after all. The boiler certificate extension is only intended to allow the Tr5 to perform at this year’s Wolsztyn gala not for the engine to work in revenue earning service. We trust that the many visitors from abroad who booked to travel behind the Tr5 were not too disappointed. Meanwhile if there is anyone out there who would like to sponsor the Tr5’s next major overhaul, PKP Cargo would be delighted to hear from you… . Narrow gauge tram from Mrozy to Rudka Sanatorium. Following our photo report on the narrow gauge trams in Lodz, a discussion on other locations with narrow gauge trams has been flourishing in our comments column. Narrow gauge tramways have been identified as operating in Bydgoszcz, Torun, Grudziaz, Elblag, Krakow (no longer operating) and Mrozy. Mrozy? A 2.5 km horse-drawn tramway survived here until the early 1960s connecting the station to the Sanatorium at Rudka. A hat tip to ‘Podroznik’ for the link. Polish railways ‘Then’ and ‘Now’. The above film was created on a train simulator. Congratulations to Wilu12! BTWT postings have been disturbed by my really bad cold and sundry minor ailments. Normal service will be resumed as soon as I recover. Krosniewice station and yard at dawn on the last day of operation 31.03.2008. From a photograph by Tilo Rösner. 2000 Waldemar Kacprzak, the line’s general manager, on hearing about PKP’s plans to withdraw from all of its narrow gauge railway operations, starts lobbying the then Mayor of Krosniewice that the Town Council should take over the Eastern section of the Kujawy Railways, the Krosniewicka Kolej Dojazdowa (KrKD). 2001 PKP withdraws freight services and closes the railway. 2003 Krosniewice Town Council acquires a licence from PKP to use the railway formation and agrees to take over the freehold when land title matters are complete. It appoints SKPL to be the line’s operating company. 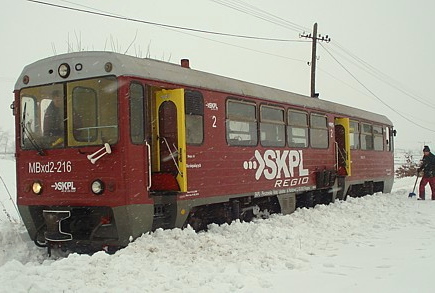 2003 In December, SKPL run their first freight train on the KrKD. The train consists of wagons from the Czech Republic which are carried on transporter wagons as far as Cetty station. 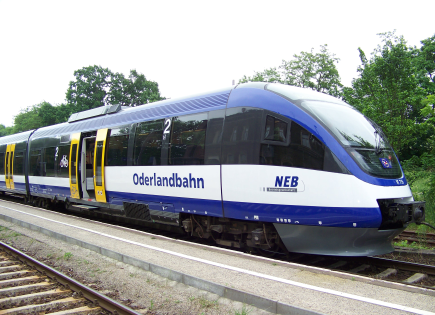 2006 The first special train runs through to Ozorkow. 2007 Barbara Herman, the new Mayor of Krosniewice, visits the railway in the company of PKP officials and announces her interest in developing the Krosniewice station and workshop site. SKPL are asked to vacate the workshops and confine their activities to the engine shed area. SKPL refuse, pointing out that the workshops are essential for the maintenance of the transporter wagons on which the freight service depends. The Mayor says that she is ‘not interested’ in the freight services, but would support a short ‘museum railway’. 2007 SKPL are offered a major contract to carry heavy aggregate on the KrKD. 2007 SKPL ask the Mayor for an extension of their license so that they can make the necessary investment in new facilities and equipment to carry the aggregate. 2007 The Mayor issues a notice to quit to SKPL. 2008 The line closes at the end of March. 2008 The Mayor withdraws from the 2003 agreement whereby Krosniewice Town Council take over the whole line and promotes her own plan whereby each of the dozen or so municipal authorities through whose territory the line runs take over their section of line independently. The Mayor maintains that the line would have needed a major subsidy to remain open. In fact SKPL were actual paying part of their income from the line to the Council! 2009 Apart from a couple of special workings from Krosniewice to Ozorkow initiated by local railway enthusiasts, the KrKD remains closed. 2009 The Mayor threatens to withdraw entirely from taking over ‘her’ fragment of the KrKD unless sizeable portions of the Krosniewice railway site are excluded from the designation of ‘operational railway land’. We understand that PKP are only weeks away from chopping up the line’s real estate salami fashion and transferring the freehold of each section to the municipal authority through whose territory each segment runs. We also understand that there is concern in some quarters of the office of the Chief Executive of Lodz province that such a development would run counter to any long-term to revive a significant section of the Kujawy railway as a major tourist attraction. Please take a few minutes to write to the Chief Executive of the Lodz province urging that the provincial government take over the whole line in order to safeguard its integrity. Only the provincial government has the credibility and ‘clout’ to bring the various local authorities – each of which has their own ideas for their section of railway – into line. 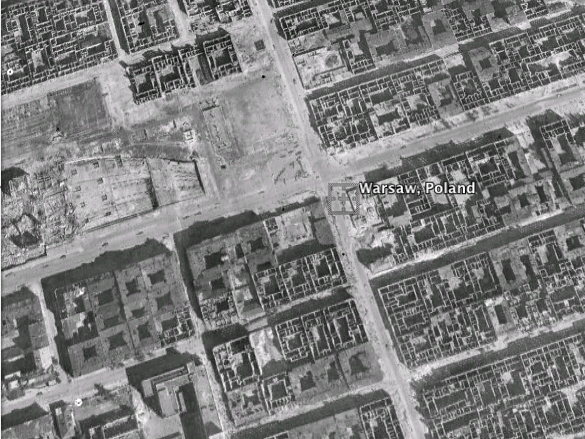 Google have added WWII era aerial photography of 40 European cities to their on-line historic photographic database which can be accessed through their Google Earth software. The cities in today’s Poland for which these photographs are available, their dates and their sources are: Warsaw (Polish Air Force 1935, Soviet Air Force 1945), Wroclaw (RAF 1943) and Gdansk (RAF 1943). The pictures showing the aftermath of heavy bombing raids are a bitter reminder that dropping high explosives on people is an obscene way of settling international disputes. Tragically the fervent hopes of all those who hoped that after WWII a more civilised way would be found to settle such questions have been cruelly frustrated. While the RAF photographs are understandably blurred (pilots flew high to frustrate the aim of anti aircraft batteries) the Soviet photographs taken just after end of the war are pin sharp. It is possible to ‘fly’ over Warsaw in 1945 and experience the devastation in a way no textual description ever can equal. Suffice it to say that Hitler planned the complete destruction of the Polish capital and the establishment of Neue deutsche Stadt Warschau, a small provincial German town, in its place. By the end of the war 85% of Poland’s capital lay in ruins. The three images below are taken from Google Earth and are approximately centred on the al. Jezoroliemskie ul. Marszalkowska crossroads in the centre of the City. They show the eastern approach to the original Dworzec Glowny station. 1935. Photo Polish Air Force, retrieved via Google Earth. 1945. Photo Soviet Air Force, retrieved via Google Earth. July 2006. Photo ©GeoEye, ©Google, retrieved via Google Earth. 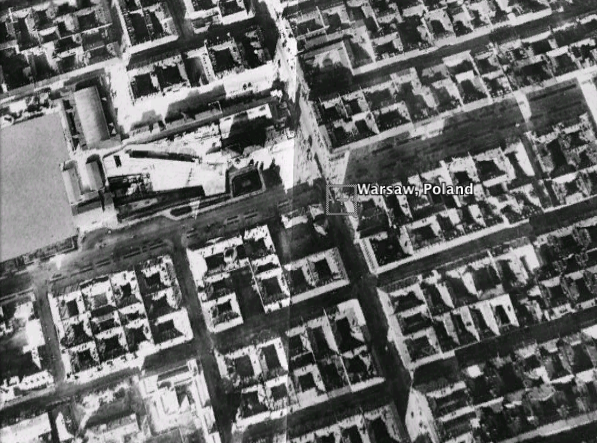 Railway enthusiasts will be disappointed that the 1935 images of Warsaw are heavily censored as regards major railway stations and junctions. Large areas are filled in with grey with the legend “KEEP LOCKED, FOR OFFICIAL USE ONLY, No right to publish”. However, the Soviet photographs taken 10 years later have no blank areas. They show fascinating glimpses of the narrow gauge lines that once ran on the outskirts of the City and will be of great assistance in researching the routes of these lines for future articles in BTWT. BTWT guest author Robert Hall is planning a visit to Poland in the summer and has enquired about the trams operating on the metre gauge Lodz tramways. So I went out with a camera a couple of times and took some quick pictures. Two Konstal 805Na units permanently coupled together as a single set at pl. Wolnosci on service 15 which takes a semi-circular route around the City. Konstal 803N articulated tram on service 46 (the strange body shape is the result of a DIY rebuild in the Ozorkow inter-urban’s workshops in Helenowek), the driver is switching the point to the line along ul. Pomorska. One of 18 Bombardier articulated ‘Cityrunners’ obtained in 2001 for service 10, now also used to reinforce the 10 Pesa articulated 122Ns that run on service 18, the so-called ‘Lodz Regional Tram’. Trams are much more sure footed in the snow than motor cars. Two Konstal 805Na units speed across a busy cross roads. Two more Konstal 805Na units on a short section of single track line near the terminus of service 12 at Stoki. Railways are run differently in Poland than on the Isle of Sodor, but the engines are just as naughty. The Pleszew Railway has its own fat controller called Mr Thomas and two engines called Trippy and Tubby. One day Mr Thomas said to Trippy, It’s a lovely day. Why don’t you go out for some fresh air and exercise? Oh no Sir, replied Trippy, there’s a lot of ice and snow about, I might trip and damage my nice new coat of blue paint. Tubby quickly butted in, Please Sir, could I go instead. A run each morning is just what I need to keep trim. Thank you Tubby, but no, said Mr Thomas. You are a plucky little engine and you always do your best, but today I want Trippy to go out for a run. Why don’t you go out for some exercise? So Trippy went. He wasn’t very happy and he grumbled as he ran along the track, I’m going to trip. I’m going to trip. I know I shall, I’m going to trip. Trippy was so busy grumbling that he did not notice some ice that had formed right next to the rail. The ice lifted one of Trippy’s wheels right off the rail and he tripped! Trippy tripped over some ice. Trippy’s driver phoned Mr Thomas. Don’t worry, said Mr Thomas, I’ll send out Tubby to help. Tubby brought out some blocks of wood and a powerful jack. Don’t you worry Trippy, said Tubby’s driver. We’ll soon get you back on the track. The drivers soon got Trippy back on the track. So Tubby had his run after all, and when Trippy came back to his shed, Mr Thomas gave him a good talking to. Mr Thomas’s little railways are run by some very funny engines. He calls them his Silly, Klanky, Perky and Loopy engines. What sort of engine would you say is Trippy? Bassett Lowke Class 10 ‘Little Giant’ class 4-4-2 in the Breslau Amusement Park. Photo from The Little Giant Story: History of the Bassett-Lowke 15″ Gauge Little Giants and the Railways on Which They Ran. Peter Bryant of Miniature Railway World is researching the history of the 15 in gauge miniature railway and (two?) Basset Lowke ‘Little Giant’ Atlantics that ran in the Breslau Vergnügungspark that was constructed as part of Breslau’s (pre-war Wroclaw’s) celebrations of the centenary of the Battle of Leipzig. Peter is particularly interested in the subsequent history of the line. What happened when the amusement park closed? When the Breslau Zoological Garten expanded into the former amusement park grounds around 1935/7 did it take over the line as a going concern? When did the line close and what happened to the steam engines and rolling stock? 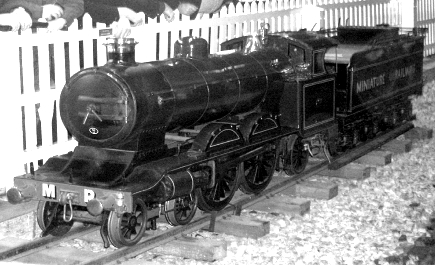 The original ‘Little Giant’ as displayed at the National Railway Museum. The website of the Fundacja Polskich Kolei Waskotorowych (The Polish Narrow Gauge Railway Foundation) carries an announcement that Pawel Szwed, long-standing chairman of the Foundation has resigned. There is also a comment that the headquarters of the Foundation has been transferred to Rogow and that all donations made to the Foundation will now be used for the development of the line from Rogow to Biala Rawska. BTWT understands that Pawel Szwed was unable to bring negotiations with the Kozenice Forestry Commission to a successful conclusion regarding the relaying of the Pionki Forest Railway through the Kozenice Forest. Local volunteers became frustrated at the slow rate of progress and started to grumble that the Pionki Skansen was looking more and more like restaurant with a railway theme rather than a ‘proper’ railway museum. Pawel Szwed’s achievement at Pionki has been absolutely amazing, as anyone can see for himself by browsing the historic photo gallery at the Pionki section of the FPKW website. We pass on our best wishes to Pawel and hope that – if he decides that there is no long term future at Pionki for his 600 mm gauge railway and rolling stock – he will find a more receptive environment elsewhere. 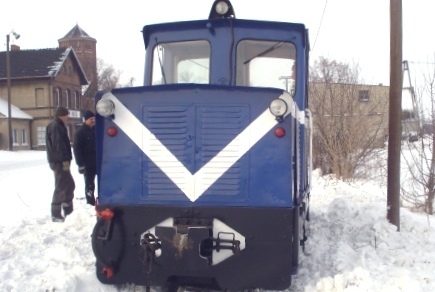 OL49 rescues railcar stuck in snow! 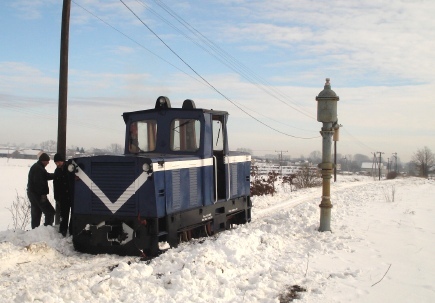 Wojciech Lis reports on his Wiadomosci z Parowozowni w Wolsztynie (News from Wolsztyn Shed) website that today a diesel railcar running from Zbaszynek to Leszno became stuck in the snow at Solecko. Ol49-7 was despatched from Wolsztyn Shed at 12:20 and by 13:05 had hauled the railcar to Wolsztyn. Meanwhile Ol49-59 was despatched to haul the 13:30 Wolsztyn – Poznan turn and the 17:13 return from Poznan. It was fortuitous that both Ol49s were in steam; OL 49-59 had earlier hauled a spacial train to Tuchorzy for TVN. Niederbarnimer Eisenbahn train at Seelow-Gusow. One of our correspondents reports on his trip from Berlin to Bydgoszcz. The different approach to railway transport in Germany and Poland was quite apparent. How long will it be, I wonder before NEB trains run through to major destinations in Poland? From Kostrzyn, the szynobus craze seems to have taken over. The Kostrzyn to Krzyz service was made up of a ZNTK Poznan-built 2-car unit on single axles, not bogies. It was quite packed, but inside it was cold. Both toilets were locked out of service, but there was a definite whiff of toilet chemicals inside the car. The ride to Krzyz went quite well, though at one point the conductor told someone that the connecting Krzyz – Pila service was odwolany, and this story made the rounds, although no official attempt was made to inform passengers. Disused station at Dobra Nowogardzka. Photo Remigiusz Jozefowicz. For over 5 years years now the Municipal Council at Dobra Nowogardzka has been negotiating with PKP S.A. to take over that portion of the Stargard Narrow Gauge Railway (Stargardzka Kolej Wąskotorowa, Pol.) (Saatziger Kleinbahn, Germ.) that lies within their boundaries. Simultaneously the the Stargard Municipality hasbeen negotiating to take over the section that lies within their boundaries. Sadly neither council saw fit to obtain a licence granting them pro tem rights to use the railway land prior to the conclusion of negotiations. In the meantime, without an effective custodian, a great deal of track has been stolen on both sections. Dobra council officials estimate that some 20% of the track may be missing on their section. The Stargard Narrow Gauge Railway. Map Wikipedia Commons. Now the land acquisition is almost complete and the Internet has been buzzing with rumours that the Council are planning a major reconstruction of the railway with the introduction of regular passenger services. The facts are rather more prosaic. On completion of the railway transfer the council will ‘look for an investor who has the financial resources to rebuild the railway’. So another worthwhile railway gets parked in cloud cuckoo land. It is a great pity. The Stargard Narrow Gauge Railway is a fragment of the Pomeranian narrow gauge railway network which at its greatest extent in 1939 stretched to 640 km. The Stepnica-Golczewo-Gryfice-Trzebiatow sections were the subject of my first attempt at railway preservation lobbying in the late 1960s. Whether my puny efforts effected the eventual outcome, I don’t know. The Stepnica branch was acquired by the municipal government of Stepnica and turned into a cycle path around 2005. The Gryfice-Trzebiatow section was acquired by the Reval Town Council who run steam-hauled tourist trains on 40 km of line between Gryfice and Pogorzelica. Robert Hall has written a scholarly article for BTWT on the Pomeranian narrow gauge railway network. I am just waiting for the weather to clear so that I can take some photographs to accompany his text. Stargard Szczecinski (Stargard Pom. Germ.) Station in 1903.